Tonight, I threw away two, perfectly edible, wonderfully delicious Publix cupcakes. I can almost see the shock and awe in your eyes. WHY IN THE WORLD WOULD YOU DO SOMETHING SO SACRILEGIOUS? I am a lover of all things Publix. Publix bakery goods are on a whole other level for me. But I was driven mad, you see. I had no other choice. I'm sure you can guess the culprit. His name rhymes with Jiggy. After an open-handed, Real Housewives kind of slap, to the side of Little E's cherub face, Big E scored himself three fat minutes in timeout at the bottom of our stairs. He sat down and immediately began his negotiating. MAKE SURE YOU START THE TIMER! DON'T LET LITTLE E TOUCH MY TOYS! I reminded him of the timeout rules. No talking. No moving. He broke both in world record time. I asked him numerous times to sit back down and be quiet. Every time he spoke I added another minute to his sentence. At last count, Big E was due to serve 28 minutes in timeout. This was going to really push back bedtime here at the Yoys. I was desperate for him to listen to me so I used Mr. Yoy's leftover birthday cupcakes in my negotiations. THE NEXT TIME YOU GET UP THE CUPCAKES ARE GOING IN THE TRASH! I died a little inside when the words escaped my mouth. And, in true three year old fashion, he stood right up. But here is the thing about me. I'm stubborn. And when it comes to a power struggle with Big E, I always win. 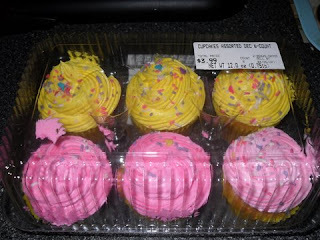 I strode across the kitchen, grabbed the container of cupcakes, and made my way down the hall to the garage. Big E leapt from time-out and began pulling on my clothes. I was in my post-shower, comfy mom uniform. Too big sweatpants, a tank top, and a flowy schmata to cover my tank. Big E pulled my schmata off one arm. I powered through. I dramatically swung the garage door open. This was happening folks. I made my way to our green herby curby. Big E was screaming. He pulled at my sweatpants. Down they came. All I needed now was for Mr. Yoy to come home early for dinner, pop open the garage, and the whole neighborhood would have had quite a show! I lifted the lid and tossed them away (tear). And it was over. THAT HURT ME MORE THAN IT DID YOU! TRUST ME! Next time Big E is serving time, he'll follow the rules. Snicker. RIP. You will be missed. By my belly.